Need to order high quality wrought iron gates for your property at an affordable price? If so Garden Gates Direct have a range of UK manufactured designs for sale at some of the most appealing prices online making them perfect for the discerning property owner looking to add security and privacy to their property whilst making a bolt statement to the entrance of their garden or driveway. Hand crafted in the UK by a team of highly skilled craftsmen our Royal range of traditional wrought iron gate designs are available to buy online today in a variety of visually appealing styles in a size to suit your budget. To find out more about this range of products read more details below or call now on 0844 804 5577 to speak to us direct. Alternatively send an email stating the design you like and the size you require to sales@gardengatesdirect.co.uk and we will be more than happy to discuss your options and provide a quote. Designed to create a strong and imposing appearance to the entrance of the garden or driveway the Royal Talisman wrought iron design is simply beautiful. Taking inspiration from old fashioned Scottish architecture each gate within this range is carefully crafted in the UK using our heaviest duty solid steel components to ensure strength, rigidity, reliability, performance and ultimately represent exceptional value for money. 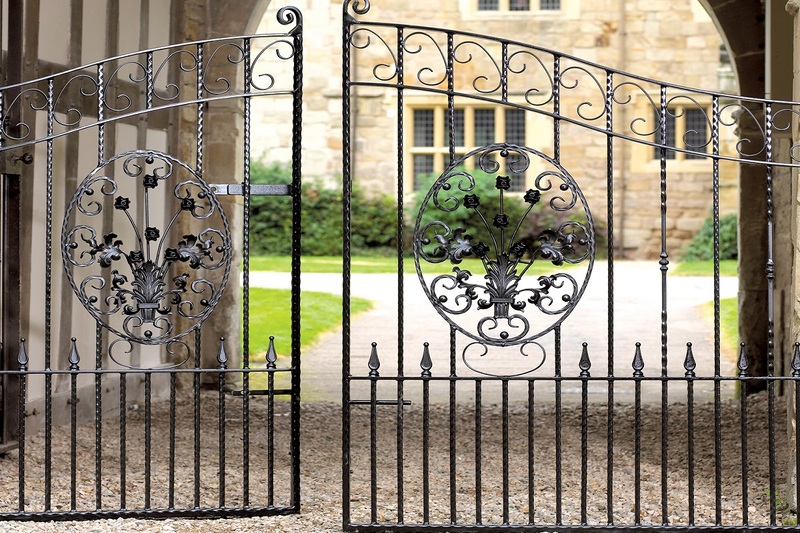 Suitable for any residential property the main decorative features centre around fleur de lys finials and circular scrollwork which helps to create the imposing appearance many homeowners are looking for in a wrought iron gate design. Alternatively if you would prefer a slightly different appearance we are able to substitute the standard finials for a more subtle ball top detail. What Designs are Available to Buy Online? Royal Talisman Wrought Iron Garden Gate – This popular style is perfect for securing pedestrian entrances into the garden or the foot path at the front of the property. Available in a choice of standard sizes to suit common opening widths or where required can also be supplied in a made to measure size. Royal Talisman Wrought Iron Side Gate – With an imposing height of 6ft and a solid steel construction this superb value gate design will offer enhanced levels of protection to any side entrance, foot path or rear access point into your garden. Royal Talisman Driveway Gates – Representing great value for money the timeless 4ft wrought iron design will create a magnificent statement at the entrance of your driveway, help secure your property and restrict access to your home. Royal Talisman Estate Gates – Manufactured to industry leading standards using high grade components this style is one of our most popular choices where privacy and security is of paramount importance to the homeowner. Available to buy online in a choice of flat top and arched gate designs the Royal Talisman is fast becoming a must have addition for any high value property. To find out more information about the Royal Talisman design or to get a quote for the size you require call now on 0844 804 5577, email sales@gardengatesdirect.co.uk or fill in our online form stating your requirements and a member of staff will be on hand to offer support. Designed to create a spectacular statement to the front entrance of your property the Royal Balmoral simply oozes character. Handmade in the UK to a superior level of finish these eye catching gates feature a traditional arch top, a choice of decorative panels, wrought iron style spiral bars, decorative scrollwork and a solid steel framework to ensure strength, performance and reliability at all times. 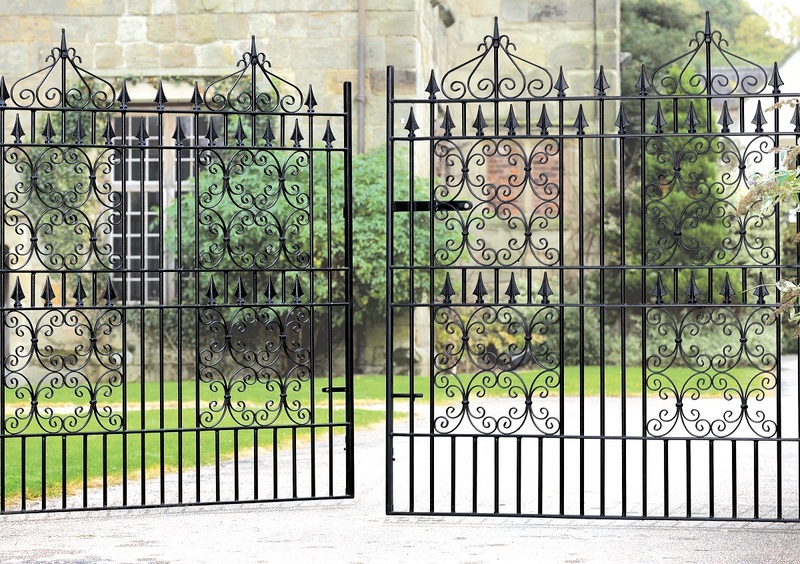 Compatible with most types of traditional UK architecture the Royal Balmoral wrought iron design is available to order online now in a varied selection of sizes making them the perfect addition to any residential driveway or large entrance. Balmoral Wrought Iron Estate Gates – Manufactured from heavy duty steel components this design will make a bold statement at an affordable price. 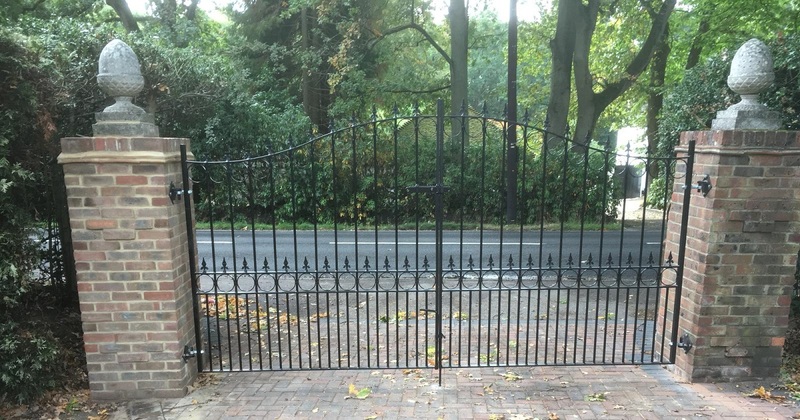 With a height of 6ft in the centre reducing down to 5ft at the sides and a choice of standard and made to measure widths up to 16ft these gates are terrific value for money, will add security and improve the aesthetic appeal of your property making them a great investment for any homeowner. 7ft High Estate Gates – Featuring the same design as the shorter 6ft high gates this design benefits from additional height which will not only offer a better level of security but will also achieve a more imposing appearance. For further details about the Royal Balmoral design call now on 0844 804 5577, email sales@gardengatesdirect.co.uk or complete the online form stating your size requirements and a member of staff will be on hand to offer help and advice. By far our most decorative and visually appealing style the Royal Monarch design will make a bold statement to any garden or driveway entrance. Built with a fine attention to detail these stunning gates are handmade in the UK and benefit from a heavy duty solid steel framework and infill bars, visually appealing wrought iron style scrollwork, imposing spear shaped finials and a large decorative crown effect scroll on the top to create a regal overall appearance whilst our competitive price policy ensures they remain within the budget of the average UK property owner. 4ft High Garden Gate – Ideal for small pedestrian entrances around the garden this attractive design will add security and enhance the overall look of your property. 6ft High Side Gate – Where a higher level of security is required this design is perfect for securing side entrances in to the garden, rear access points or even at the front of the property. 4ft High Driveway Gates – This option will make a significant statement to the main entrance of your home. Available to buy online in a range of sizes this highly desirable design is proving more and more popular due to the competitive price and high quality finish. 6ft High Estate Gates – Where a high level of security is required but the is to be no compromise on aesthetic appeal these stunning gates are in our opinion the perfect choice.